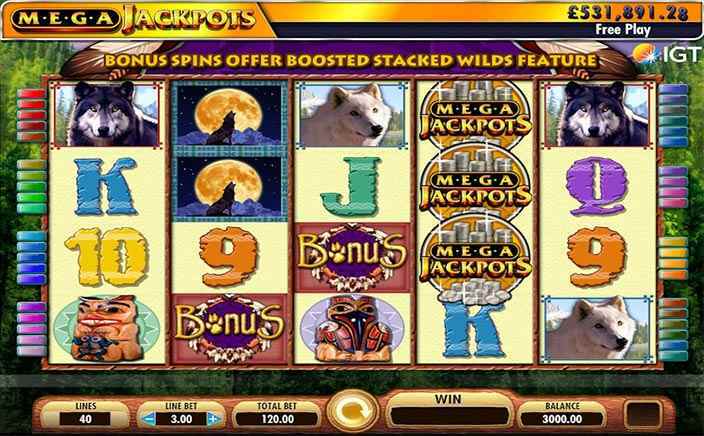 IGT has released it’s all new slot based on wolf theme “Mega Jackpots Wolf Run” which has 5 reels, 3 rows and 40 adjustable paylines. This game is much like its predecessor “Wolf Run” with added progressive jackpot and other new bonus features. The theme has a beautiful view of snow mountain and forest in the background covers it all. 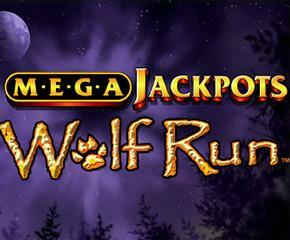 Mega Jackpots Wolf Run slots have 14 symbols in total with 11 regulars and 3 special. The 11 regular symbols include Howling Wolf, a Grey Wolf, a White Wolf, a Bird Statue, a Man Statue and some literals (9, 10, J, Q, K, A) arranged in higher to the lower value. They can award you from 5x to 1,000x. The Howling Wolf will award you £30,000 for 5 symbols. The 3 special symbols include Wild which is the Howling Wolf, the bonus scatter symbol and a scatter symbol. The Wild can substitute for any symbol except for the special symbols and take up to 4 positions on a reel. Free Spins: When 3 Bonus Scatter symbols appear on reels 2 – 4, then a round of 5 Free Spins is activated which can also be increased if more scatters appear during the feature. Not only these, all the winnings during this round will be doubled. Progressive Jackpot: When the Mega Jackpot symbol appears on the reels and take 4 spaces then you will be awarded a progressive jackpot. If you are looking for big wins then Mega Jackpots Wolf Run slots is the for you as it offers a massive jackpot of £500,000 and has an RTP between 91% to 93%. You can play this slot game on any smart gadget including iPads and iPhones.